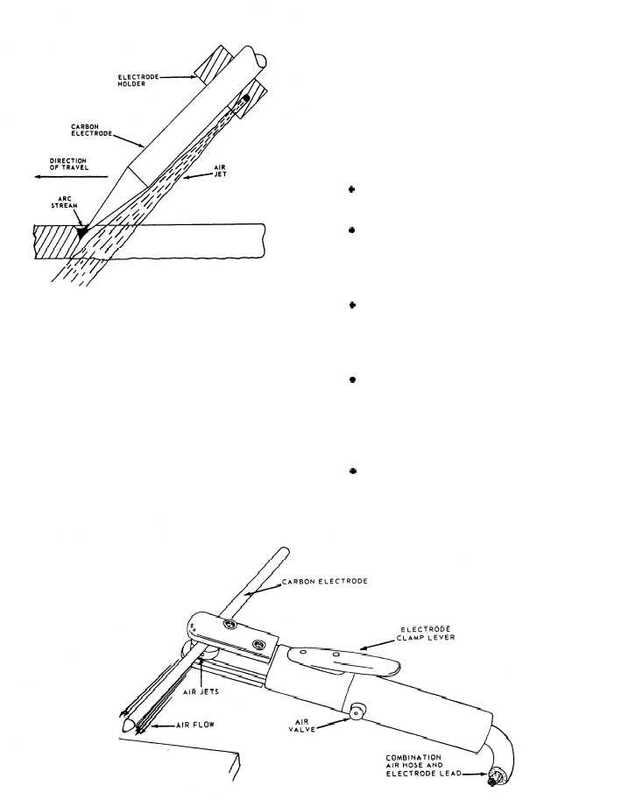 Home > Construction Training Manuals > Steelworker Volume 01 > Figure 7-53.Air Carbon-Arc Cutting. Figure 7-53. - Air carbon-arc cutting. metal. Figure 7-53 shows the process. The equipment consists of a special holder, as shown in figure 7-54, that uses carbon or graphite electrodes and compressed air fed through jets built into the electrode holder. A push button or a hand valve on the electrode holder controls the air jet. The air jet blows the molten metal away and usually leaves a surface that needs no further preparation for welding. The electrode holder operates at air pressures varying between 60 and 100 psig. During use, bare carbon or graphite electrodes become smaller due to oxidation caused by heat buildup. Copper coating these electrodes reduces the heat buildup and prolong their use. Adjust the machine to the correct current for electrode diameter. Start the air compressor and adjust the regulator to the correct air pressure. Use the lowest air pressure possible-just enough pressure to blow away the molten metal. Insert the electrode in the holder. Extend the carbon electrode 6 inches beyond the holder. Ensure that the electrode point is properly shaped. Strike the arc; then open the air-jet valve. The air-jet disc can swivel, and the V-groove in the disc automatically aligns the air jets along the electrode. The electrode is adjusted relative to the holder. Control the arc and the speed of travel according to the shape and the condition of the cut desired. Figure 7-54.-Air carbon-arc electrode holder with carbon electrode installed.